On Saturday we had a reunion with the other families from our childbirth class. I was the oldest baby by almost a month, and I was also the only girl! 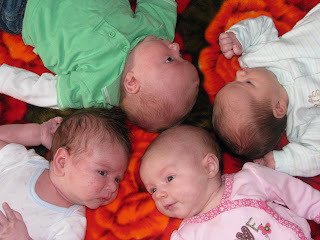 It was fun to see the other babies, and all the Mommies and Daddies got to compare birth stories. I am almost 8 weeks old and weigh 10 pounds 9 ounces. This is the same as one of the other baby's BIRTH weight. Oh, I feel sorry for his Mommy! Today, however, was not such a fun day. Today Mommy and Grammy took me to visit the Metabolicist and the Geneticist. Those are fancy names for special doctors. My metabolic tests keep coming back inconclusive, so in order to help find out for sure whether I am affected by the VLCAD I had a skin biopsy taken today. The doctor took a punch of skin from my left tricep area. It made me cry! It will take between 4-8 weeks and two separated labs to grow the skin cells and test them for my enzyme levels. I sure hope it doesn't leave a bad scar. Here are the potential outcomes: #1: my enzyme levels are normal and I can go on a regular diet (this is what we are hoping for!) I will always be a carrier of the VLCAD but this would mean that it is not affecting my metabolism. #2: my enzyme levels are low which means that I have symptoms of the VLCAD. This would be bad news and I would have to meet with a genetics counselor and a metabolic nutritionist to figure out my treatment plan. In the meantime until we get the results I am still on frequent feedings, and we got a note from the doctor outlining what needs to be done in case I get any illnesses. So, while we are waiting for the results, we accept all prayers and good thoughts! Not only were you the only girl but you were by far the cutest baby there. That was not very nice of that Dr. to make you cry!! I will continue to pray for good news. I can't wait to see you this weekend (and your mommy and daddy, too). Lots of thoughts and prayers coming your way from out here in Chicago!